Last week I asked myself "Chrono, what would you say you actually contribute here?" "Nothing, really" I told the John McGinley voice in my head, "I complain about stuff, a lot." So with the goal of "don't be a complete waste of consciousness" in mind, I thought "what do I know a lot about?" Ok, then what is a subject I kind of know about that's easily research-able that I can then regurgitate for the pretend admiration of my internet peers? And from that I got Final Fantasy Summons compared to their real-life counterparts. So, let's begin this with one of my favorite Summons Ifrit. Ifrit come from Arabic and Islamic folklore. They are a class of infernal (hellish or diabolical) Jinn (spirits) and are portrayed as giant winged humanoid creatures of fire, known for their strength and cunning. Living underground, Ifrit live in a structured society, having their own kings, tribes, and clans. Ifrit are like any Jinn and can be either good or evil, but are often depicted as wicked and ruthless. Ordinary weapons have no effect on Ifrit, but magic can be used to capture or kill them. Ifrit is a fire-elemental summon that shows up in most games in the series, usually as an early summon (heck, he's literally the first boss of Final Fantasy VIII). His signature move is called Hellfire, hitting enemies for large amounts of fire damage. He usually appears mostly humanoid* with dark brown skin wearing a loincloth or kilt. In the early non 3D Final Fantasy games, Ifrit does seem to live up to his namesake well. He is a mostly humanoid fire spirit of immense strength. His Hellfire attack references the real-life Ifrit's reputation as hellish beings. In Final Fantasy VIII, I think a case could be made for the link between real-life Ifrits' vulnerability to magic and the fact that, unless you grind like crazy before hand, ice magic and summoning Shiva (yeah, we'll get to her some time) are the best ways to defeat him. Except for the lack of wings (which, I couldn't find any pictures of Ifrit with wings, so I can forgive that) and the giant horns everything seems good. But as the years went on, Ifrit's design was changed. In every game he started looking less humanoid and more bestial. 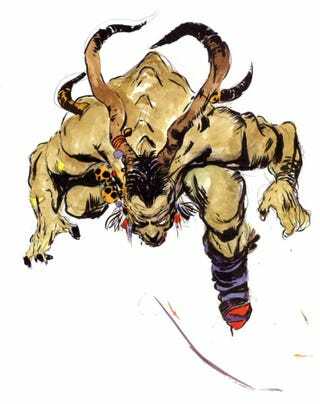 After his appearance in Final Fantasy VIII all pretense was dropped and Ifrit, instead of appearing as a noble fire spirit, became nothing more then a beast of raw power. Which is still awesome (Final Fantasy X is my favorite design for him), but doesn't keep with the image of his real-life counterpart. I think Final Fantasy did a good job of representing Ifrit's real-life counterpart early on. While they've changed him over time and have now almost completely destroyed most links to the original, I still give Final Fantasy a pass for Ifrit. So now, who to do next? I decided not to do this as one big post because A) I have the attention span of a goldfish and B) when researching some of the OTHER summons, I found a lot of interesting stuff that would have had to have been cut to keep the post from being huge (not that Ifrit benefited from this since every site I looked at had the same 2 paragraphs of information about them). Shiva seems logical, given the massive middle finger she is to her namesake.